What do people and plants have in common? How does growing a garden resemble building relationships with others? Must you have your own grandchildren to be a bubbie? 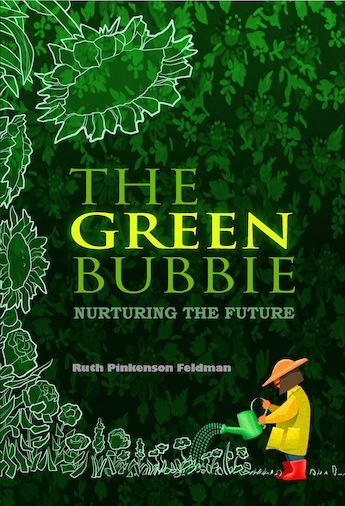 Internationally recognized early-childhood educator and recipient of the prestigious Covenant Award, Dr. Ruth Pinkenson Feldman answers these questions and many more in her newly published book of wisdom and inspiration, The Green Bubbie. “Bubbie” is the Yiddish word for grandmother, but Dr. Feldman reveals that all women can be bubbies--to their own grandchildren, to other children, and to other adults as well. Just as a grandmother connotes acceptance and unconditional love, we can offer those gifts to people--children, women, and men--we meet in our daily lives. A master gardener, Feldman uses the metaphor of the garden to explain how propagating and nurturing plants is similar to feeding and tending the souls of others as well as ourselves. Dr. Feldman founded an infant/toddler program at the Germantown Jewish Center in Philadelphia and was a consultant for early childhood education for the Auerbach Central Agency for Jewish Education in Greater Philadelphia. For more than ten years, she served as the director of early childhood education services at JCC Association, the continental network for Jewish community centers in North America. While there, she introduced An Ethical Start, an innovative values curriculum for JCC preschools based on teachings in Pirke Avot, as well as This New Month, a Web-based program for JCC early-childhood educators, which provides teaching ideas for the Jewish calendar. Dr. Feldman has taught at Gratz College, Arcadia University, and Temple University. Incorporating ancient Jewish wisdom and values into contemporary life, The Green Bubbie crosses the boundaries of denomination and even religious traditions. Everyone can benefit from Dr. Feldman’s insights into friendship, loss, love, and fear, and how powerful human connections can make our lives more meaningful and as beautiful as the flowers blooming in the garden. Posted in The Blog on August 14, 2014 by Miriam Rinn.